Eleanor de Lacy must have been mad to agree to exchange identities with her stronger-willed cousin. Remington Knight is strong, ruthless and determined to marry the duchess of Magnus…and he believes that is Eleanor! Worse, Eleanor is charmed by Remington ‘s attempts to seduce her. But when he learns of Eleanor’s deception, this daring rogue will wreak havoc…upon her reputation and her heart. Remington had expected a haughty, unbending aristocrat who would ensure his entrance into good society. But this “duchess” is a most pleasant surprise — modest, warm-hearted, endearingly awkward, and a delight to the eye. In short, she is exactly the sort of bride Remington could fall passionately in love with. 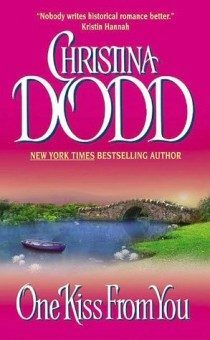 If only he still had a heart… Read ONE KISS FROM YOU, the second in the Switching Places series, from Christina Dodd, the author you love. The idea of two very diverse characters switching places isn’t a new one, but it was new to me. The scene in book #1, SCANDALOUS AGAIN, when the duchess tries to iron a dress, was a riot. And in book #2, ONE KISS FROM YOU, taking the duchess’s meek companion from a timid mouse to a woman willing to do anything to get and save her man made the entire book a delight to write. The duchess of Magnus’s coach pulled up to the tall house on Berkley Square, and an imposter stepped out. The imposter’s long, sturdy traveling cloak covered plain, dark, modest traveling clothes. Like the duchess, she was tall and well-rounded, and she spoke with the duchess’s aristocratic accent. Also like the duchess, she wore her black hair smoothed back from her face. Yet for the discerning eye, the differences were obvious. The imposter had a sweeter, rounder face, dominated by large blue eyes striking in their serenity. Her voice was husky, warm, rich. Her hands rested calmly at her waist, and she moved with serene grace, not at all with the brisk certainty of the duchess. She was slow to smile, slow to frown, and never laughed with glorious freedom. Indeed, she seemed to weigh each emotion before allowing it egress, as if sometime in the past every drop of impulsiveness had been choked from her. She was observant, composed, and far too quiet. Yes, a knowledgeable person would recognize the differences between the duchess and the imposter. Fortunately for Miss Eleanor Madeline Anne Elizabeth de Lacy, no such person was in London at that moment, with the exception of her groom, her coachmen and footmen, and they were all devoted to her cousin, the real duchess, and to Eleanor, the duchess’s companion. They would never betray Eleanor's mission. They would never tell Mr. Remington Knight the truth. "If you would follow me, your grace, to the large drawing room, I will order tea," Mr. Knight's stern-faced butler led her across the rich foyer and opened a door. "Thank you," Eleanor said with composure. "And more substantial refreshments, also." For she suspected Mr. Knight intended to keep her waiting, and it had been five hours since breakfast. In the drawing room, tall windows let in the timid sunlight, and the candles washed the walls with a pleasant golden glow. Books lined one wall, reaching all the way to the twelve foot ceiling, and the scent of leather bindings, fresh carnations, and oiled wood blended to create a familiar smell, a smell that seemed to Eleanor to be uniquely British. This room had been created to put a guest at ease. Eleanor would not relax. Such a lack of vigilance could not be wise, and in truth, when she thought about meeting Mr. Knight, her stomach twisted into knots. But neither would she dance to Mr. Knight's tune. He no doubt imagined she would grow more anxious the longer she waited. Well, she would, but he would never know. With every appearance of airiness, she wandered to the bookshelves and examined the titles. She found the Iliad and the Odyssey. Mr. Knight was a barbarian from the Colonies. Perhaps he had acquired the books so he could sniff the richness of their bindings. Yet a worn title caught her eye, a book by Daniel Defoe. Robinson Crusoe was an old friend, and she reached up, trying to pull it down off the shelf just over her head. She couldn’t quite touch the spine, and glancing about, she found a library stool. Dragging it over, she took the long step up and in triumph pulled the book from the shelf. This book had been read, and read again, for it fell easily to the page where Robinson found Friday. That was Eleanor's favorite part, also, and she couldn’t resist reading the first few lines. And the next few lines. And the next, and the next. She didn’t know what dragged her from the lonely island where Robinson survived and despaired. She heard nothing, but experienced a sensation that prickled along her spine like a warm touch caressing her skin. Slowly, with the care of prey beneath a predator’s survey, she turned her head — and met the gaze of the elegant gentleman lounging at the door. In her travels, she had seen many a handsome and charming man, but none had been as handsome as this — and all had been more charming. This man was a statue in stark black and white, hewn from rugged granite and adolescent dreams. His face wasn’t really handsome; his nose was thin and crooked, his eyes heavy lidded, his cheekbones broad, stark and hollowed. But he wielded a quality of power, of toughness, that made Eleanor want to huddle into a shivering, cowardly little ball. Mollify? Him? Not likely. Nothing would mollify him. Nothing except … well, whatever it was he wanted. The immediate reality was that she would somehow have to step down onto the floor and of necessity expose her ankles. It wasn’t as if he wouldn’t look. He was looking now, observing her figure with an appreciation all the more impressive for its subtlety. His gaze flicked along her spine, along her backside, and down her legs with such concentration, she formed the impression he knew very well what she looked like clad only in her chemise. Well. She couldn’t keep staring at him. She snapped the book shut. In a tone she hoped sounded serene, she said, "Mr. Knight, I was indulging myself in your formidable library." Very calm. Immensely civilized. She waved a hand along the wall. "You have a great many titles." Inane. Still he said nothing. He failed to respond to her conversational gambit by word or gesture. His silence made her lift one shoulder defensively. If he was trying to intimidate her, he was doing a first-rate job. Just when she was going to say something else — she didn’t know what, but something that would crush this beast and his pretensions — he started forward. At once she realized she had named him correctly. He was a beast. He moved like a panther on the prowl, all smooth and leggy – and he prowled toward her. The closer he got, the bigger he seemed, tall and broad at the shoulder. He seemed an element of nature, a rugged mountain, a powerful sea — or a beast, a huge, ruthless beast who kept his claws hidden until he chose to use them. In a moment of panic, the imposter thought, My God, Madeline, what have you let me in for? Then he was beside her. Eleanor looked down into his face, framed with hair so pale it looked like a halo around his rugged, tanned features, and wondered if he would use those claws on her now. Reaching up, he wrapped his big hands around her waist. The touch was like the heat of a fire after a long bout of winter. No man ever touched her. Certainly not a beast of such epic proportions, a man of ruthlessness who imagined he could buy his way into the tight-knit heights of English society. Yet he did touch her, pressing his hands into her flesh as if measuring her for fit, and from his expression, he found the fit acceptable. More than acceptable, enjoyable. And she … her senses absorbed him with an eagerness that left her embarrassed and gratified. She found herself breathing carefully, as if too deep a breath would cause her to spontaneously combust. The scent of him added to her discomfort. He smelled like … oh, like the crisp, still air at the top of the Alps. Like a cedar grove in Lebanon. Like a man who could give pleasure … and how did she know that? She was as pure as the driven snow, and likely to stay that way to the end of her days. Men did not wed twenty-four year old companions who had no dowry and no chance for one. Tightening his grip, Mr. Knight lifted her off the stool. Incredulous, Eleanor dropped the book. Grabbed for it. Almost overbalanced. The book landed with a thud. He tipped her body against his. Reeling and operating totally by instinct, she clutched his shoulders. Shoulders immovable and strong as a boulder in a storm. Slowly, gradually, he allowed her to slither down him, as if he were a slide and she an artless child. But she didn’t feel like a child. She felt … she felt like a woman, confused, overwhelmed, driven by an absurd desire for a man whom she had never before seen. A man she knew to be a scoundrel of extraordinary audacity. She, who had been so careful to steer clear of those very emotions! Just before her toes touched the floor he stopped her, and gazed into her face. His eyes, she saw, were a pale blue, like chips of frozen sky. In the dark, smoky voice of a veteran seducer, he said, "Your grace, welcome to my home." He let her slide down those last few inches. She stepped back with the self-possession of the real duchess. His hands lingered on her waist before slipping away, and this time his voice contained a razor-sharp edge of menace. "I have looked forward to this day for a long, long time."